According to DSM, hydrogen tanks are the next step in fuel storage. According to DSM, hydrogen tanks are the next step in fuel storage. Hydrogen’s low ambient temperature density results in a low energy per unit volume, which requires the development of advanced storage methods that have the potential for higher energy density. ‘We had already developed this technology for compressed natural gas (CNG) tanks, and now we are testing the same material and design principles for hydrogen tanks to meet the needs of the automotive industry,’ said Bert Keestra, application development engineer at DSM. 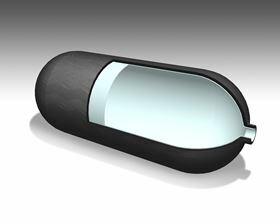 The two-part tank design features a blow molded liner made of Akulon Fuel Lock, a polyamide 6-based engineering plastic with a high barrier to hydrocarbons. The tank can then potentially be further reinforced by wrapping it in unidirectional (UD) continuous fiber-reinforced thermoplastic tapes made of EcoPaXX polyamide 410. The result could be the lightest-weight plastic tank available for hydrogen storage applications, according to the company. Reducing weight is key, since every 10 kg removed from a vehicle roughly translates into a reduction in CO2 emissions from the vehicle on the road of one gram per km. This story is reprinted from material from DSM, with editorial changes made by Materials Today. The views expressed in this article do not necessarily represent those of Elsevier. Faurecia has acquired exclusive access to intellectual property to make composite hydrogen tanks from Stelia Aerospace Composites.